Mercadero will be present at SIAL 2016, supporting international companies in their trade fair participation at this food innovation exhibition. SIAL 2016 will take place from 16 – 20 October in Paris. We will be coaching clients from Indonesia and the Philippines. PT Yuasa Berkah Makmur from Indonesia and Cocoplus Aquarian Development Corporation and KF Nutri Foods from the Philippines will exhibit in the CBI Pavilion in Hall 5a, stand R216. PT Yuasa Berkah Makmur sells the unique small yellow mountain papaya, which grow in the Dieng plateau in Central Java. The papaya is processed into jam, papaya in syrup, juice, dried papaya and candy. Cocoplus Aquarian Development Corporation produces organic virgin coconut oil, using the fresh wet centrifuge method. Supply of fresh coconuts is secured through local cooperatives in the regions Batangas and Quezon. KF Nutri Foods specialises as a manufacturer of pan fried sliced banana chips, which are widely used international in the breakfast cereals, snack food and food blend industry. They are also promoting a newly developed range of coconut products: virgin coconut oil, desiccated coconut and coconut milk, available in bulk and consumer pack. The fourth company, Aliet Green, will exhibit in the National Pavilion of Indonesia in Hall 4, stand M 138. 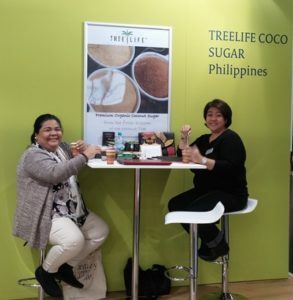 Aliet Green produces certified organic food products, including coconut palm sugar, ginger coconut palm sugar, cinnamon coconut palm sugar, turmeric and nutmeg. The company works with the local community in a responsible manner and seeks to promote and empower the role of women. We will be pleased to meet you at SIAL.